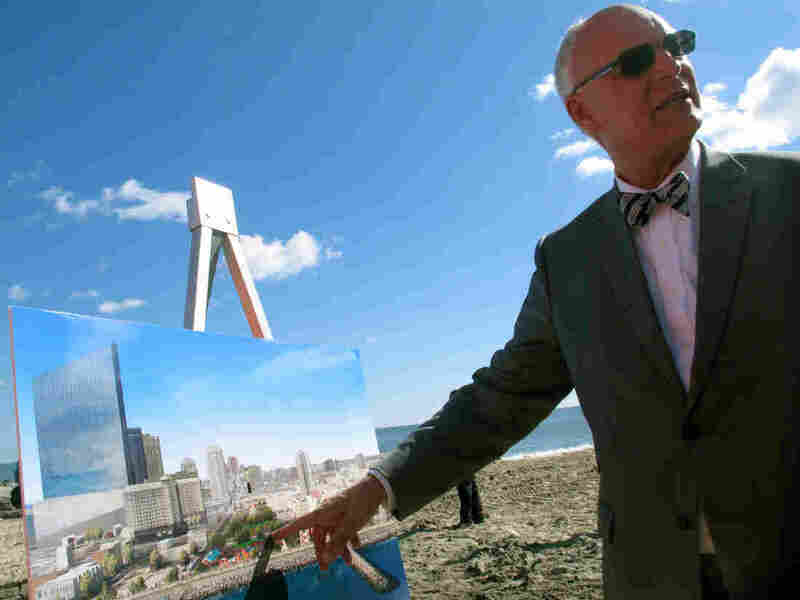 Atlantic City Faces Financial Collapse, Cringes At State Takeover The mayor says his town, known for its boardwalk casinos, will run out of money soon. State lawmakers have a plan to get the city's finances under control, but city leaders say it's a bad deal. Mayor Don Guardian examines an artist's rendering of a boardwalk reconstruction project in October. Without a cash infusion, Guardian says all nonessential city services will shut down on April 8. Atlantic City is wondering when its losing streak will finally end. The mayor says his town, known for its huge casinos on the boardwalk, will run out of money in a few weeks. State lawmakers have a plan to get the city's finances under control. Atlantic City leaders don't like the state's takeover plan. But residents are hoping for anything that will change their luck. "A lot of people are walking away from their homes," says Al Bailey, a local real estate agent who was born and raised in Atlantic City. "We have an old saying: We got sand in our shoes," says Bailey, meaning he has no plans to leave this faded beachside resort town. But he knows plenty of people who can't afford to stay. "Just getting and leaving," Bailey says. "They just can't make ends meet." Last year, the Atlantic City area had the highest foreclosure rate in the country, according to RealtyTrac. That's partly because of lost casino jobs. And it's partly because of rising property taxes. That's been hard on people like 86-year-old William Cheatham, who used to own a house on North Maryland Avenue. "We had been there for 50 years," Cheatham says. "The taxes just got to begin to get too high for us. We was on a limited income. We was just taxed out of our home, basically." "The big problem is the continuing decline in the casino industry," says Oliver Cooke, associate professor of economics at Stockton University. "Now I think that has spiraled into a housing crisis. And of course, the fiscal crisis that the actual city of Atlantic City currently faces." The casinos used to account for much of Atlantic City's tax revenue. But four of the city's casinos closed, leaving only eight in business. Two-thirds of the city's tax base has disappeared since 2010. To make up for the shortfall, Atlantic City raised taxes on its residents, by a lot. But the city is still coming up short. Without an infusion of cash, Mayor Don Guardian says all nonessential city services will shut down on April 8. There was a tentative agreement with the state that was supposed to stabilize the city's finances. But Guardian says it's a bad deal for Atlantic City. "The final piece of legislation that the state presented to us was far from a partnership," Guardian said at a news conference last month. "It was absolutely a fascist dictatorship." Guardian says the plan amounts to a total state takeover — one that would allow New Jersey lawmakers to sell off city assets and break contracts with the city's public sector unions. Council President Marty Small says the city has been trying to avoid that by shrinking the government payroll. "Everyone wants to point to spending," he says. "It's not spending. The spending is lower, the budget is lower." City leaders say they've cut about $25 million from the budget. But that leaves a deficit of more than $30 million — and potentially hundreds of millions more going forward. Gov. Chris Christie is defending the proposed state takeover. "I have to have the freedom to do what needs to be done down there to fix the problem," Christie said on his radio show earlier this month. "Bloated salaries, bloated pensions, bloated agreements. Be able to negotiate with creditors. I've got to be able to do all that. If I don't have the tools to do all that, then why bother?" Without help from the state, Atlantic City could be looking at bankruptcy. Things may get worse before they get better. In the fall, New Jersey voters will decide whether to allow casinos in the northern part of the state, closer to New York City. That could take even more business away from Atlantic City, says Oliver Cooke at Stockton University. "Those dollars are going to end up somewhere else," he says. "You know, that's empty hotel rooms and empty gaming halls." Maybe more empty houses, too.